"Justice, Respect, Honor, Benevolence, Humility, Courage and Loyalty." Rônin Goju Ryu Kai World Karate Organization (RGRK), it is an empty hand based academic system of self-defense dedicated to the promotion of the Okinawan, Japanese and American Karate Do art of Goju (Hard-Soft). Rônin Goju Ryu Kai represents a new step into the evolution of Goju Ryu Karate Do, creating a necessary balance between the traditional roots of the art as conceived by the founder of its base style, Miyagi, Chojun Dai Sensei and the 21 st century interpretation and development of Rônin founder, Montalvo, Carlos H., Hanshi, incorporating modern concepts of combat, situational awareness and self-preservation into the traditional close-quarters self-defense martial art known as Goju Ryu Karate. I am taking this opportunity to personally thank every single one of you for your friendship and valuable membership to any of our three Ronin Brotherhood Ronin Goju Ryu Kai World Karate Organization (RGRK), the International Ronin Martial Arts Federation (IRMAF) and the Ronin Police Defensive Tactics Association (RPDTA). Your membership enabled us to accomplish so much this year. Our goals are to have our members coordinate international events to participate in other Ronin event allowing them the opportunity to travel internationally representing their dojos. This year, two members of the Ronin Executive Board traveled to Canada and on my behalf promoted Canada Region’s Directors Renshi Adette Rice and Renshi James Fries to the 6th Degree Black Belt and the title of “Shihan”. This year we were able to visit the Country of Venezuela. This visit was a very important one, our last visit was almost ten (10) years ago. The Venezuelan Country Directors had done an outstanding job spreading the Ronin Brotherhood through their country. Numerous seminars were offered to members of the three groups. Ranks recognitions and promotions were offered to included two very special ones, RGRK member Gabriel Delgado (Physically Handicap) to Brown Belt and IRMAF member Don Salcedo, an 84 years young to 5th Dan . Also Ronin Executive Board Kyoshi Dr. Richard Velasquez, on my behalf promoted RGRK Director William Rodriguez to the 6th Dan and the title of “Shihan”. We were able to visit the Ronin Puerto Rico Region and assisted in the selection of new Directors and established a Board of Director for PR composed of very experienced and knowledgeable Martial Artists. The Director of PR Ramon Colon along with the Director of the State of Florida were promoted to the Ranks of 6th Dan. They are planning to have a half a dozen Ronin events this year. During our visit to Mexico and after some seminars and trainings, experience martial artists from the styles of Shito Ryu and Muay Thai, joined RGRK. Sensei Irving Barroso MBA and Sensei Ricardo Puentes Esq. were selected as Country Director of our new Mexico Region. At this present time, Renshi Parmod Chand from India is in the final step of becoming the India Region Director for RGRK along with several Black Belts. During this year, In Trinidad & Tobago a group of excellent “Budokas” continue doing an outstanding job for IRMAF and numerous seminars are been coordinated. This year, two new Regions Mexico and India joined Ronin Brotherhood. It is anticipated that new members coming from South Africa will be joining us. With your membership and renewals we will be able to create and exhibit new Ronin merchandize items at our websites, www.roningojuryu.com and www.roninpolice.com. We are proud of what we’ve able to do and we could not have done it without you! We are asking to please renew your membership today! For new members please click on the patch of the Ronin group that you choose for the respective PDF application to appears, fill it the blanks and mail it with the membership fee to the provided address. Some of these Rônin became martial arts instructors (Sensei), bodyguards (Yoyimbo), protectors of villages (Damyo), etc. Many Martial Arts Schools (Ryu) were created by a Ronin. Musashi Miyamoto (1584-1645) was the most famous of them all. During 1701-1703 the famous forty-seven (47) Rônin in the service of Asano, Lord of Ako, waited for approximately two (2) years for the opportunity to avenge the death of their lord/master, who was obliged to commit seppuku/suicide by orders of Shogun Tokugawa after an incident between lords Asano and Kira. But 47 of Asano’s most faithful Samurai, now Rônin, resolved to avenge his death on Kira. On December 14th, 1703, after avenging his death, all 47 Ronin surrender themselves to the authorities and committed seppuku on the orders of the Shogun in front of Asano’s tomb, on February 4th, 1703. The people acclaimed them as heroes and became “…the symbol of courage, honor and loyalty” As a martial artist I always value these three virtues of Courage, Honor and Loyalty as shown by these Faithful Warriors. This is why I selected Rônin® as the name of our Brotherhood, the Rônin Brotherhood®, home of Rônin Goju Ryu Kai World Karate Organization®, International Rônin Martial Arts Federation®, Rônin Police Defensive Tactics Instructor Association® and of course “Team Rônin®”. Goju (Go “Hard” & Ju “Soft”) Ryu Karate is a traditional Martial Art with a very well defined history, and lineage of succession traceable to the roots of the predecessor (Kanryo Higashionna) of its founder Chojun Miyagi to this date. Yamaguchi Gogen Sensei was the personal disciple (Deshi) of Miyagi O’Sensei, he initiated and trained Master Peter Urban into the path of Budo as its conceived through the eyes of Goju Karate. Goju-Ryu Karate remains and effective and powerful fighting method today. The original concept of Goju Ryu Karate was to create a powerful combat system that developed strong fighters, on their hands and on their souls. Rônin Goju Ryu Kai maintains a clear commitment to the preservation of the tradition of the Goju Karate created by Miyagi O’Sensei, but incorporates fighting methods and self defense techniques that are in tune with the critical and violent demands of today’s street survival. Salas, former City Major of his adopted hometown of San Sebastian. Hanshi Carlos H. Montalvo joined his (oldest) brother Miguel and both practiced Okinawa Kempo Karate-Do under Master William Hernandez. Under the supervision and guidance of Master William Hernandez both brothers were tested and promoted to 1st Degree Black Belt from the Shigeru Nakamura lineage. Hernandez and now Hanshi Montalvo met and became students of Hawaiian Kempo Karate Master Cecil Peoples (a direct student of Bill Ryusaki, Van Nuys, California). Under Master Peoples, Hanshi Montalvo obtained 2nd and 3rd Degree Black Belt. From 1974 to 1978, 80  81, Hanshi Montalvo became the Inter-American University, San German Campus (Puerto Rico), Physical Education/Martial Arts Professor, Team Coach and IAU Karate Team Captain. In 1978 to 1979 Hanshi Montalvo traveled to study at Yale University and the University of Connecticut, Psychology Post-graduate School. During that time, he taught Karate and Full Contact seminars at the Eastern Connecticut State College and the Windham Youth Center (for disturbed youngsters). Lou Ferrigno, Latin Singers Jose Feliciano, Jose Jose and Menudo (Ricky Martin) among others. Hanshi Montalvo competed in 385 black belt tournament winning in 365 of them. His Full Contact/Kick Boxing career was of 36 fights, winning 33 and 31 by way of Knock Out. On April in 1984, he moved to Miami, Florida to work as a Special Agent for the U.S. Treasury Department. During this time he began a long-lasting friendship still carried today with Grand Master Manny Saavedra, founder of Sansei Goju Ryu World Karate Organization. 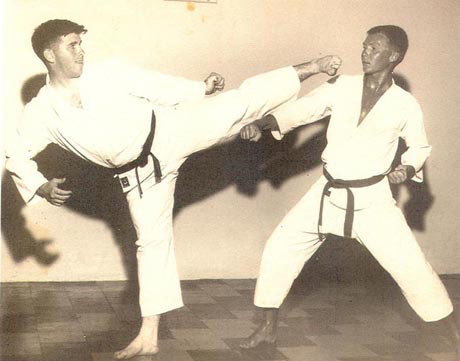 Master Saavedra was a direct student of Peter Urban – Father of American USAGA Goju Ryu. in the history of the FBBA. He also competed in the first US Open Orlando, Florida Championships in 1980 and celebrated his 50th birthday by competing in the 2006 US Open again. In both occasions he placed in the top three positions. of Sansei Goju with 400 Black Belts under his management worldwide. He competed in many tournaments becoming USA  AAU Champion and subsequently Sparring World Champion of WWKO. At the end of the year 2000, (The year of the Dragon) Hanshi Montalvo with Hanshi Saavedras blessing, left Sansei and founded Ronin Brotherhood LLC® composed of three based Martial Arts Organization to wit: A) Rônin Goju Ryu Kai World Karate Organization (a Japanese/Okinawa Goju Ryu based karate organization that believes in rescuing the traditional values and ancient combat techniques of Okinawan Goju, incorporating contemporary fighting methods in tune with todays challenges), the B) International Rônin Martial Arts Federation (a Federation composed of several different Martial Arts Styles & Organizations) and C) Rônin Police Defensive Tactics Association (the only World Association composed of Sworn Law Enforcement Officers, all Martial Arts practitioners and instructors of several LE Agencies and Military LE Organization, with the common goal to improve their tactical operations techniques through the proper use of Martial Arts and Street Survival Techniques). Presently there are more than 600 Ronin Brotherhood black belt members in 16 countries, including approximately 75 black belt members from the ranks of 5th Degree to 10th Degree Black Belts. Hanshi Montalvo belongs to several other martial arts organization as an advisor on their Excecutive Boards. Throughout his long and intense Martial Arts career, Hanshi Carlos H. Montalvo has been inducted in many re-known Martial Arts Halls of Fame. He has appears in the cover of many Martial Arts magazines and have written many martial arts and self defense articles. He just finished his Ronin Goju Ryu Kai handbook. 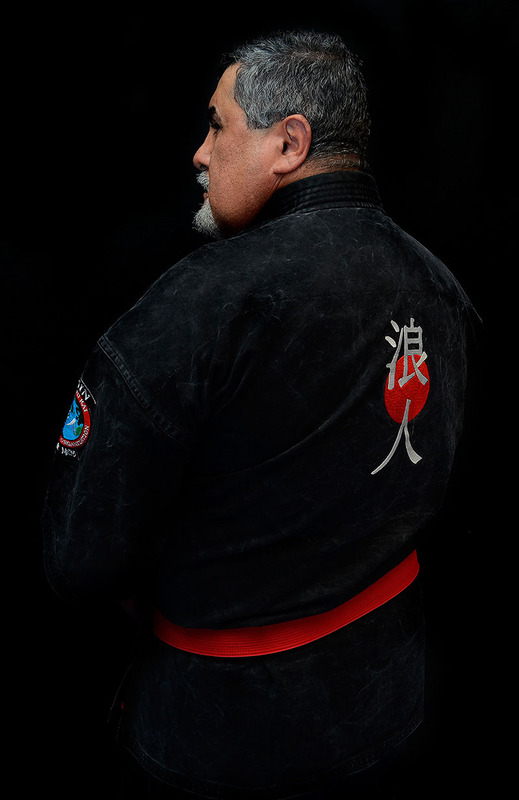 Hanshi Carlos H. Montalvo is a U.S. Government Senior Special Agent for for the past 26 years and a Certified Instructor on Closed Quarters Combat, Safety & Survival, Street Alertness, Advance Undercover Operations Techniques. Special Response Team (SRT) and Special Weapons and Tactics (SWAT) Instructor, he is presently a Peer Support Team Member and an SRT Crisis/Hostage Negotiator with a U.S. Government Agency. TV Episodes. Hanshi Montalvo had appeared in the cover of numerous martial arts magazines and books. in Goju Ryu Karate Do by the Hawaiian International Martial Arts Society. On October 2006, Hanshi Montalvo competed in an International Championships in Colombus, Ohio, winning 1st places in the Masters Kata and Kumite Division. On August 2007, Hanshi Montalvo competed in the International Cosmopolitan Florida Championships in Orlando, Florida, winning 1st places in Masters Kata and Kumite Division and the Kata Overall Grand Champion. On November 2009, Hanshi Montalvo competed in a World Championship in Orlando, Florida representing the Puerto Rico Team winning a Silver Medal and a Bronze Medal in Team Overall competition. by the Unione Palestri di Artis Marcialis. Kyoshi Jesus Cendan began his Martial Arts training in 1976 under the teachings of Sensei Claudio Gonzalez in Union City, New Jersey; at the time he was 13 years old. Sensei Claudio Gonzalez was teaching Goju Ryu Karate-Do. Once there, Kyoshi Cendan (who prefers to be called Sensei) remained in the school until he was tested and awarded his green belt. Sensei Cendan’s family had to move away to initiate a new job related venture and he was forced to pause his Karate training for a short while. Some eighteen (18) months later Sensei Cendan met a young man who was taking some Karate lessons with an instructor by the name of Kevin Norlander. Sensei Cendan asked the young man if he could take classes with his instructor, to which his new acquaintance replied that he would have to check “because his instructor did not teach everyone” and “any new student would have to be brought by a black belt to join in the classes”. “Lucky for me” Sensei Cendan said, “the young man was one of that Sensei’s black belts”. Sensei Cendan was later told that he was allowed to join this karate group. According to Sensei Cendan’s own words: “I was also happy to know that this Sensei was also a Goju Ryu style practitioner, I could not believe how lucky I was”. Short after beginning training in Goju Ryu Karate-Do, Sensei Cendan discovered that Sensei Norlander was a direct student of Hanshi Peter Urban the founder of USAGA, and considered by many as the father of American Goju, a student and friend of Hanshi Gogen “The Cat” Yamaguchi, who was in turn a student and friend of Goju Ryu Karate-Do Founder O’Sensei Chojun Miyagi. At the time Sensei Norlander was living with Grand Master Urban. Upon interview with Sensei Jesus Cendan he referred to those days: “What a great time this was! Being able to spend time with such great Martial Artists, like Hanshi Peter Urban, and my Sensei Kevin Norlander”. In 1984 Sensei Cendan moved to Miami, by that time Sensei Cendan had already achieved the rank of Sandan (3rd Degree Black Belt) from his Sensei, friend and mentor, Kevin Norlander. Upon leaving to Miami, Sensei Norlander advised Sensei Cendan to find his old Dojo brother Hanshi Manuel “Manny” Savedra. Sensei Cendan had met Hanshi Manuel Saavedra many years earlier, and he was taking into Hanshi’s organization like one of the family. Under the tutelage and guidance of Hanshi Manuel Saavedra, Sensei Jesus Cendan obtained the rank of Shihan (6th degree black belt), it was during this time that Sensei Cendan met Hanshi Carlos H. Montalvo at the famous “Calle Ocho Dojo” (Miami’s 8th street Training Hall). Sensei Jesus Cendan remained under the tutelage of his teacher and friend Hanshi Manuel Saavedra’s until Hanshi’s departure to New York in 1999. 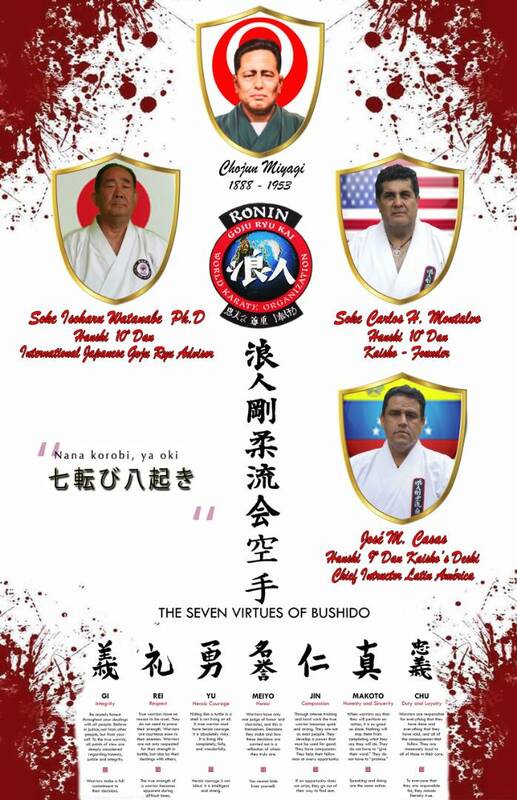 After Hanshi Saavedra’s departure, Sensei Cendan remained by Hanshi Carlos H. Montalvo’s side assisting him in the organization of the institution created by Hanshi Saavedra. 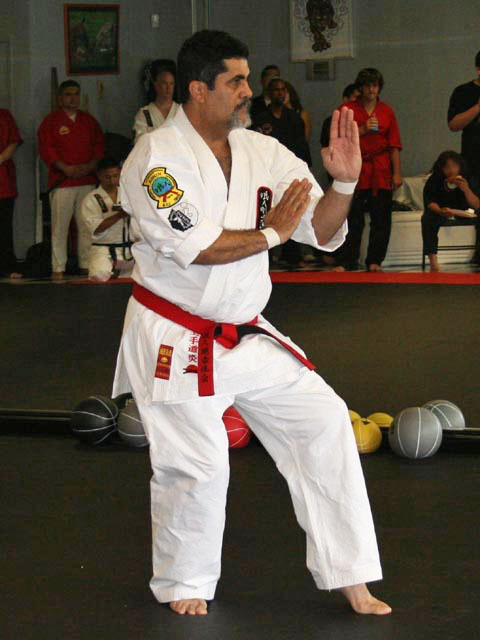 After a series of events, Hanshi Carlos Montalvo decided to start a Goju Ryu based system that would re-discover the ancient values secreted in the ancient tradition that embodies Goju. This new system was based on the concept of rescuing the old tradition of training and incorporating the close quarter combat techniques encompassed in Goju combining Hanshi Montalvo’s real street survival experience as a Federal Agent, and his World Class competitor skills, to form a style that is strong in combat, with real applications for Self-defense and graceful and effective for competition. All this was possible in part with the direct support and great ideas, provided by the sea of knowledge and courage of Sensei Jesus Cendan. Between Hanshi Carlos H. Montalvo, Sensei Jesus Cendan and with the wisdom, support and guidance of Renshi Joseph E. Benitez, the three Goju practitioners and friends gave birth in the year of the Dragon (2000) to the concept that later came to be known as Rônin Goju Ryu Kai World Karate Organization and the Rônin Brotherhood, LLC. On 2008, Sensei Cendan was promoted to the 7th Dan (Nanadan) by Hanshi Montalvo. Soke Dr. Isoharu Watanabe, Hanshi Dr. Donald McNatt, Hanshi Dr. Phillip Davis, Hanshi Jose Casas, So-Shihan Felton Messina, Hanshi Maurizio Martina, Hanshi Gary Legacy, Hanshi Dr. Diego Cardin, Hanshi Oscar Alicea, Hanshi Daniel Torres. Senior Grand Master Jhoon Pyo Choi; Grand Master Pedro Vangas; Grand Master Eduardo Perez. Shidoshi Glenn Perry; Shidoshi Pierre Rene; Sijo Amalio Guerrero; Sitagung Dr. Jose Perfume, Sitagung Dr. Harold Mayle (RIP). Hanshi Dr. Michael Willet, Hanshi Vicente Guzman. Kyoshi Israel Rodriguez, Kyoshi Francis Blesa. Sensei GM William Hernandez, GM Cherry Ortega. Attny Renshi Joseph E. Benitez; Attny Renshi Santos Ruiz; Attny Renshi Samuel Casas; Attny Kyoshi Enrique Adames. Dr. Renshi Santos Ruiz MD; Dr. Sensei Ricky Ramos MD; Zulma Colon ARNP. Frmr Delta Force Chief Richard Quiles; Frmr US Agent Renshi Daniel F. Benitez, Frmr US Agent Kyoshi Woody Best; Frmr Mexican SWAT Renshi Francisco Choy; Green Beret Lt. Col. Raul Rivera; FRMR Correctional Agent Shihan Rafy Rodriguez MS; Frmr USMC Gunny Renshi Ian Carr; Frmr Agentina Marine Kyoshi Francis Blesa. Jitsumi Gōgen Yamaguchi (山口剛玄; January 20, 1909 – May 20, 1989), also known as Gōgen Yamaguchi, was a Japanese martial artist and student of Gōjū-ryū Karate under Chōjun Miyagi. He was one of the most well-known karate-dō masters from Japan and he founded the International Karate-dō Gōjū Kai Association. His name was a household word in Karate circles, and he appeared in all the major Martial Arts magazines and publications, both in Japan and the western world.